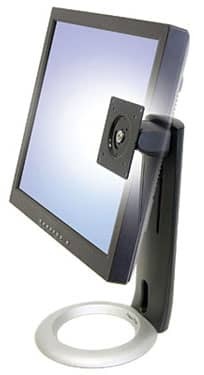 The Ergotron Neo-Flex LCD Stand Instantly set the height of your LCD for a more comfortable computing experience. Instantly set the height of your LCD for a more comfortable computing experience. With fingertip effort, raise or lower your LCD 5" (130 mm), pan left/right, tilt forward/back and rotate your screen for portrait/landscape viewing.